I called my Mom the other day to tell her, Thank You, I was sorry and that she was right. For what she asked? I simply replied for everything! I took Levi down to SGI to get his Learner's License. 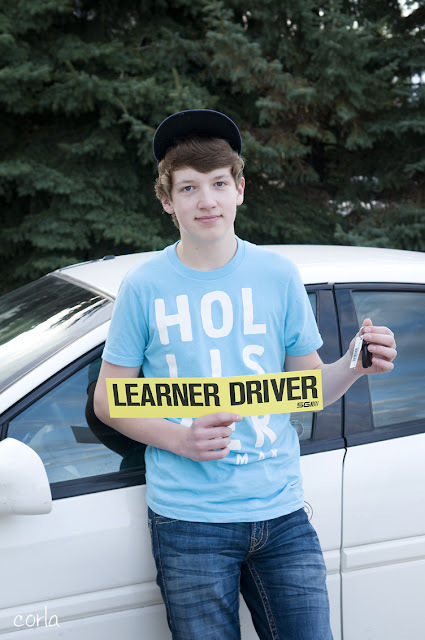 He had completed nearly 2 months of in class studying and has been on the planet for 15 years so that qualifies him to get behind the wheel of a car. I have never seen Levi so motivated to go to school as you were only allowed to miss a couple of driver trainer classes before you couldn't get your license. They taught them about the rules of the road, what the signs on the side of the road mean but not how to even start a car. We left the office with his temporary license in hand and he climbed into the drivers seat. He had no idea how to operate the vehicle and they have left it up to me to teach him. A 15 year old who I can't get to rinse the toothpaste out of the sink is now in charge of a moving vehicle. Hey SGI how about you hand out a bottle of Valium for the parent with each new license issued that would make everyone in the car a lot less stressed out. As I moved into the passenger side of the car I realize it is just a metaphor for everything to do with parenting a teenager. I have spent the last 15 years raising the baby, taking care of his every need, knowing where he is and who he is with every minute of the day, driving him to and from play dates, sports activities and to work. Now it is time to let go a little and move to the passenger seat to let him start driving, the car yes but also in his life. To trust that you have done a good enough job that even when you are not behind the wheel that they will make good and safe decisions. For the first year I get to sit beside him and teach him. Sometimes through encouragement and sometimes through yelling brake over and over. He is not just learning to drive I am trying my best to learn to let him. He is on his own but as my friend Karen always says there is still a soft place to fall. We are there to help him progress, allow him to make mistakes and challenge him to a little better each time. What he tells me about a being a new driver is that he can't drive us home if we have been drinking and he tells me any ticket he gets will be written to me. I am not sure if he is right but I don't want to find out. And I have to do this four more times! I am not sure where in my master plan of life did I ever think I would be potty training and driver training all at the same time! So to my parents again I say Thank You for letting me drive your car and for all the times growing up you said to me some day you will understand. Now I do! I feel your pain Corla. I remember this moment in life so well. Then when they get their real license? Very painful. I still remember the first time I watched my baby pull out of the driveway all by himself. His first trip was to Walmart. I cried the whole time until he returned. And then the first trip to the Hat and then to Regina and then to Saskatoon. sigh... it does get easier, you can trust me on that. And thank goodness for cell phones. But then of course you have to teach them not to text/talk on the cell and drive. It's hard watching them grow up.